Well, “unpacking” would be more accurate (there was no box, but plenty of bubble-wrap! ), but within a minute or so I had a nice, weighty-feeling, leather-ish case to zip open. Doing so revealed the BH-905i itself, an assortment of cables, a Nokia “fast charger” like the one which came with my N8, and a further leather-ish zip-up case, which I found contained a brace of various adapters for common audio equipment connections. Whilst it’s possible to use the BH-905i as a “wired” headset/headphones (of which more shortly), I began with its wireless mode. This being Bluetooth, I needed to pair the device with my phone (a Nokia N8)—for me, this was a simple matter of telling the N8 to scan for new devices, holding down the power button on the BH-905i for about five seconds, and letting the two find each other. I should point out that you would want to make sure the BH-905i was charged up first—the review device wasn’t, so I needed to “juice it up” for a while before it would stay linked to my N8. Both the BH-905i and N8 support the A2DP Bluetooth audio standard, so music playback sounds decent enough through the phones (dependent on the quality of what you’re playing back, naturally—if you have poor-sounding MP3s on your device, these phones will show them up). Whilst I have no complaints on the sound-quality front, I did experience one issue with these phones: they are of the “over-ear” type rather than “in-ear”, but they are not enclosed. This causes less problems with external sound than you might expect (thanks to the active noise cancellation, which I’m coming to); however, I found the headset rather heavy (in the main, probably due to the rechargeable battery inside), and no matter how I adjusted them, in many cases they hurt my ears after as little as five to ten minutes’ use. I’m not sure how much can be done about this, but obviously it’s a significant barrier to prolonged use of the phones, at least for me. Moreover, one of the main uses I would have personally for Bluetooth headphones, would be for listening to music or podcasts whilst jogging or at the gym (mostly the former). I didn’t test the BH-905i under these conditions—not only did I not want my review set to get sweaty (! ), but the aforementioned weight of the headset would probably make running wearing them a rather uncomfortable experience. On this measure alone, I’d be looking elsewhere at this point. This is one of the most welcome facilities of the BH-905i—if I understand correctly, the multiple built-in microphones continually sample the sound in the vicinity, and the phones generate an out-of-phase copy of the sound, which should cancel out much of the external noise. This is the first time I have had the opportunity to try some active noise-cancelling headphones, so I decided to test them in an environment which has significant but constant ambient noise (note: it was a safe location for the BH-905i). If you have never used decent active noise-cancelling headphones in a noisy environment (as I hadn’t at this point in time), it is hard to convey the effect. When the noise-cancelling kicked in, it sounded as if a large thick blanket had been placed over me—that is, about 75% of the ambient noise just disappeared, and I could hear the podcast clearly, with no difficulty in listening to the voices. I imagine that if I were a frequent traveller (esp. 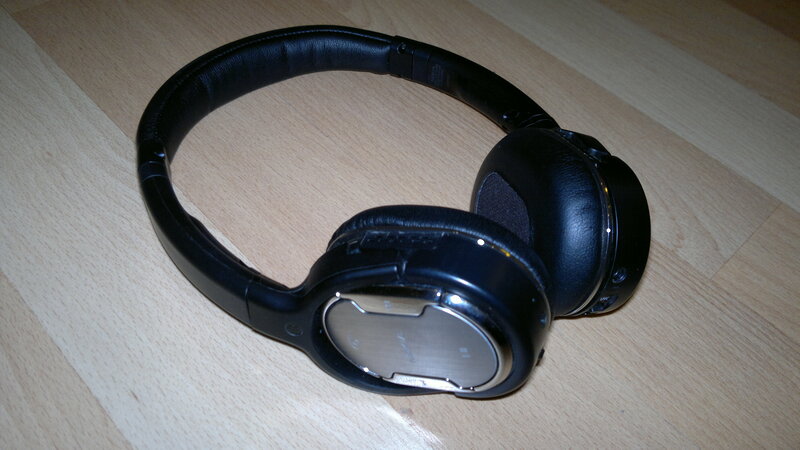 by rail or air), I would quickly find noise-cancelling headphones like the BH-905i, indispensible. These Nokia phones do a remarkable job on that front; however, as I don’t travel long-distance a great deal, I’m not sure I would be able to justify the investment in the BH-905i simply as “noise-free phones”, especially with the “weight” issue I mentioned above. Whether I would be able to find alternative phones with comparable active noise-cancelling for significantly less money, is quite another matter. With all its built-in microphones, it would seem a shame if the BH-905i couldn’t be used to make and receive calls via one’s mobile, and superficially at least, the headset doesn’t disappoint. I was able to hold a decent conversation via my N8, though it would’ve been welcome to hear my own voice through the speakers, as wearing the headphones muffles the sound of the voice “through the air”. This seems to be a phone issue, as my wired headset and Jabra Bluetooth earpiece don’t let me hear my own voice either. I also tried recording my voice via the BH-905i, posting the results on my Audioboo “channel”. Frankly, I was disappointed—you can hear the “raw” headset recording for yourself at Audioboo. To be fair, the audio fidelity may be a limitation of the Bluetooth software’s “headset profile”, but I really was expecting better quality than this. (I confess I didn’t get around to testing the BH-905i’s performance as a “wired” headset—one of the device’s most versatile features—so it’s possible I would’ve achieved higher-quality recording this way.) You will also notice the break-ups in the signal (the recording is presented exactly as I made it); this could be a Bluetooth issue, but I stayed close to the N8 whilst recording, so the distance shouldn’t have caused problems. 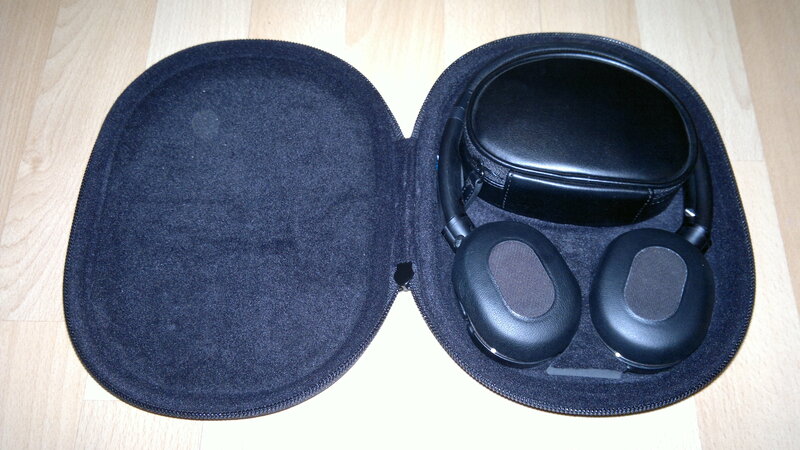 So, a mixed bag on the “call headset” front, but in fairness the “downs” aren’t all the fault of the BH-905i. At the heart of all this, let’s be clear: the BH-905i is a premium product. Whilst it costs rather more than most of us would consider spending on a set of headphones (though comparable with, for instance, the Dr Dre range, and rather less than pro recording “cans” would set you back), it justifies the outlay on its own terms by its design and high build-quality, and offers a great deal more than your average earbuds or headset. I was generally impressed by the sound quality, and the active noise cancellation is superb—if I took the train or flew a lot, I would be considering these headphones rather more seriously. On the other hand, I found the BH-905i is just too heavy on my head for my tastes, and I couldn’t go jogging or to the gym with these on, for reasons of comfort and hygiene (and bearing in mind their cost, probably personal safety!). Would I buy the BH-905i, if I had the money? Ultimately, I would have to say “probably not”, though I would stress this is not down to any failings on the part of this device. I reiterate: this is a premium product, well-designed and built to a high standard, flexible and capable of fulfilling multiple purposes, and doing well at just about all of them. I wouldn’t mind having a stereo Bluetooth headset, as it happens, but I think I would be rather more likely to buy the Nokia BH-505, as it fulfils the Bluetooth stereo headphones/headset criteria, is considerably lighter, would probably be more suitable for exercising with (though I’ve read reports that sweat can temporarily stop the device working (! )), and is far cheaper (£30-40, instead of the £150-200 I’ve seen the BH-905i sell for online). In summary: the BH-905i is a high-quality and versatile Bluetooth headset which lives up to the price it commands, though the potential buyer will have to weigh it up (literally and figuratively) for themselves, to see if the device is worth it for them.